The Alberta Conservation Association’s newest webcam joins five others that broadcast the dramatic lives of peregrine falcons. All of the streams are available to watch 24/7 on the association’s website. A new streaming service promises action and melodrama at the Misericordia Community Hospital. It's not on Netflix, but can be seen on the Alberta Conservation Association's website. The ACA's newest webcam joins five others that broadcast the dramatic lives of peregrine falcons. The cameras have high-definition night vision, allowing for 24-hour surveillance. Kelley Stark, communications editor for the association, has been watching the drama unfold this year. "It's like a soap opera," she said Monday on CBC Radio's Edmonton AM. Stark said there have been multiple fights among falcons in nest boxes this year. And the falcons don't pull any punches. "One had her claws up so far into the other one, I thought she was going to pull out her heart, like [in] a cheesy old horror movie," she said. The falcons flew away, so she didn't find out how that storyline ended. Viewers who watch the cameras have seen numerous skirmishes this spring. "I have witnessed some brutal fights," Colin Eyo, a media specialist for the ACA, told CBC News on Monday. The U of A camera follows Radisson and Chase, two falcons that have been romantically involved since 2012. The peregrine falcon was long considered a species at risk in Canada. Scientists believe the use of pesticides, particularly DDT, caused problems with fertility and growing healthy egg shells. An extensive reintroduction program helped bring the falcon back from the brink of extinction in Alberta. Many populations across the country have rebounded, leading the Committee on the Status of Endangered Wildlife in Canada to change its status to "not at risk" in December. The peregrine falcon is still considered at risk in Alberta and "threatened" under the Wildlife Act. According to a database that was last updated in 2015, there were between 50 and 60 pairs left in Alberta. Peregrine falcons typically nest on cliffs, near big bodies of water. In urban environments, they choose ledges on buildings or bridges. 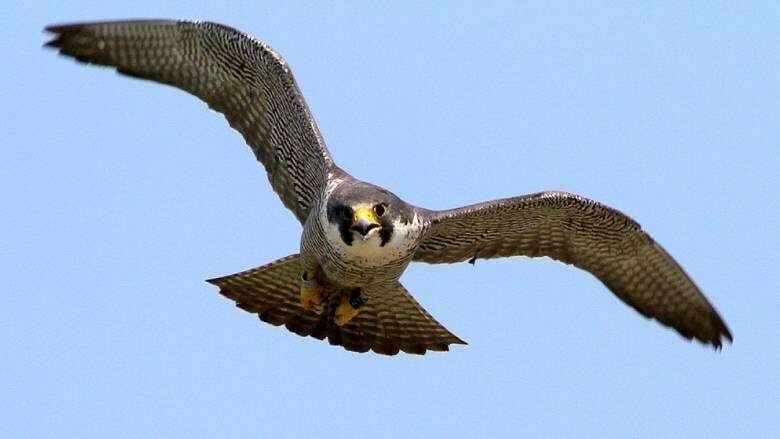 In addition to the one at the Misericordia, the association has peregrine falcon cameras installed at Edmonton's Bell Tower, the Genesee Generating Station in Warburg, Alta., the Nutrien fertilizer plant in Redwater, Alta., the Clinical Sciences Building at the University of Alberta and the Weber Centre office building in Edmonton. Peregrine falcons battled for nesting sites and mates this spring. They're now settling down and laying their eggs. Calmer scenes are forecast for May, as the females sit on their eggs and the males bring them food. Chicks typically hatch in June and July. Stark said frequently watching the webcams makes it easier to recognize individual birds. "You get really invested," she said.